Region: This fly is found in western United States and has similar species in the East. Life cycle: This insect produces one generation each year and overwinters in the soil under the walnut trees in small hard, brown cases. The adults emerge in late summer, around August and spend a few weeks on the foliage before they mate and begin to lay eggs. 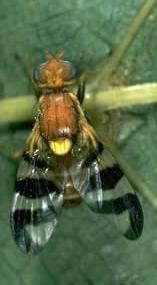 Physical Description: This light brown fly is only 1/3 inch long and has yellow markings and black bars on the wings. Its eggs are white and are laid in cavities within the husk of the walnut. Feeding characteristics: This pest will attack walnuts as well as peaches. The maggots feed by tunneling into the walnut husks, where they will remain for several weeks, until they drop to the ground to pupate. While the infestation will cause stains, the kernel usually remains unaffected. Controls: Once the walnuts have been harvested, place the nuts in water to drown the maggots. Remove the husks with the dead maggots.